Poly end unions are available in either SI or 100 formats. • Pump can be off centre from pipe work by a total of 9 degrees. 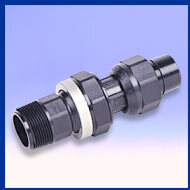 • Fits into the extensive range of HANFLO™ Poly - Pipe Fittings. • Cold fit – Fast fix – No heating of pipe required. • Maximum Working Pressure; 10 Bar (1000 KPA. 145 PSI) @20°C. • All pipe work must be adequately supported. • Use a thread sealant or Teflon tape on all threaded connections.